Ahead of President Barack Obama’s first visit to Vietnam, the country voted yesterday in once-every-five-year-elections for a rubber-stamp parliament whose membership has already been largely determined by the Communist Party. Amid worries about soaring public debt, a serious budget deficit and China’s aggressive claims in nearby seas, there’s also high hope for Obama’s visit, both in the government, which wants him to lift an arms export embargo so it can better deal with Beijing, and among rights activists who want him to hold to account a repressive one-party state seen as treating its critics abysmally. Party members have seats, according to Human Rights Watch. Expectations may be too high for any major announcements during Obama’s trip. But just the fact that he’s making time to visit Vietnam during his last year in office, when a president’s every waking moment is meticulously choreographed, signals its importance to his administration as it boosts focus on Asia, generally, and stands up to China’s rising assertiveness in the region, more specifically. Obama must balance a desire to support Southeast Asian nations like Vietnam as they confront China over disputed maritime territory with worries about the tension with Beijing this will cause and about Vietnam’s reluctance to improve its terrible human rights record. Eventually lifting the arms sale embargo would remove a final vestige of wartime animosity and signal a strategic commitment between the former enemies. U.S. lawmakers, however, have urged the president to first make sure Vietnam’s rights record has improved, and more political activists are released, before lifting the ban. When he lands in Hanoi, and then moves south to Ho Chi Minh City, formerly Saigon, he will see a vibrant, bustling land where many have been lifted from poverty in recent years. But Vietnam also struggles with public debt, the legacy of the war — unexploded ordinances, for instance — and environmental problems, like drought and salt intrusion in the country’s main rice-growing region. Some 69 million people are eligible to vote for the 14th National Assembly. A total of 500 deputies will be elected out of 870 candidates. 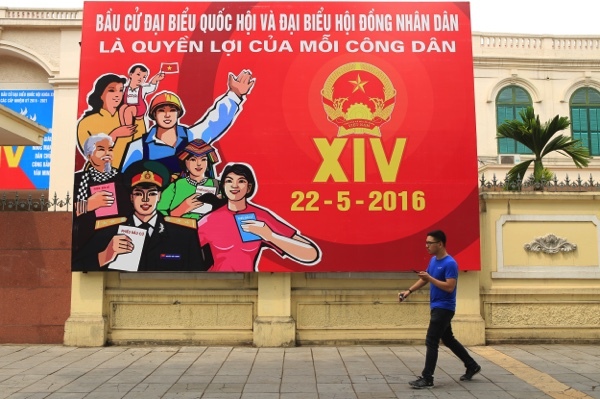 Of them, 458 must belong to the Vietnam Communist Party, which is the only party allowed to govern under the constitution. Among those contesting, 339 candidates are women, accounting for 38.97 percent, while 204 candidates are from ethnic minorities, making up 23.45 percent, according to the list of candidates released by the National Election Council in late April. China is a major issue here, and especially its reclamation of land in disputed seas and its large-scale construction of military outposts on the reclaimed land. The United States worries that conflict could break out, but also about the ability of shipping and navies to move freely in the region. Ahead of Obama’s visit, in what was seen as a goodwill gesture, Vietnam granted early release from prison to a prominent dissident Catholic priest. The Rev. Nguyen Van Ly has served several long terms in prison or been under house arrest for promoting political and religious freedoms.